Excitement is in the air!!! If you are here at CHA I would LOVE, love, love for you to head over to the Innovations display - I am SO thrilled. To see a vision I shared with others as being innovative - well... needless to say I am thrilled! BUT we need your votes - if you are at the show and you are excited about this product we would love to have you share your opinion with the crafting world, by placing your vote. Be certain to check out the beautiful framed artwork that has been created by Debbie Olson. It is beautiful in this picture, but the depth when seen in person is truly stunning! Now the news you have all been awaiting. Yep, I've seen it, touched it, watched it in action and learned more about it. 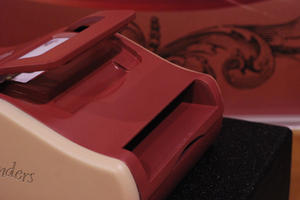 Xcalibur is smooth, quiet and does a beautiful job of both cutting and embossing! If you have the opportunity to head over to the Spellbinders booth and see it, you really should! They have a questionnaire that your participation in may make a difference in the final product. 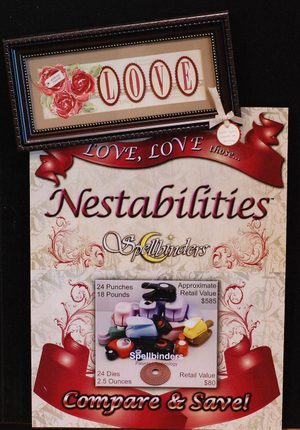 Spellbinders is a company that cares about what it is that their customer is looking for. They would like to hear your reaction to this machine - do you like the color? What do you think of the fact that it has a handle on the top to carry it? Do you like the fact that there is a drawer in the bottom to hold all your plates? I know you are all wanting to know the price point of this fabulous new tool. I am thrilled to tell you that it will be less than $150, with the goal being $129!!! Being that it is still in prototype stage it is difficult to pinpoint a final pricepoint. We have NEW NESTABILITIES!!! The much anticipated long rectangle series - I believe I asked for them to be 6" in length. Again they reduce in size scaling down to a size that will be PERFECT for sentiments. Wait until you see some of the ideas we have for using these! More TAGS! developed methodically by my wonderful colleague and friend Debbie Olson! Yes - mine was the first order placed and so I am hoping to have news for you soon as to when they will be arriving in our store!!! COPIC has some new prototypes on display. A fabulous new larger sized glitter pen that is quite stunning and works on fabric. A metallic pen that the jury is still out on being I really need to see it in broad daylight instead of under the convention center lights. Ranger's new white pen is the talk of the town! It is totally cool! and the new ink pads - I can not wait to give them a whirl today. New adhesive - a girl can never seem to have enough glue in this industry. Felt abounds everywhere and I have some fabulous ideas I cannot wait to share with you in regards to using rubber stamps and felt together. Oh dear - I am running late again, so I will stop for today. I will get back to answering more questions, probably upon my return home. It is ubber busy here and finding time to blog is extremely difficult. The best part of the show in a nutshell are the people! I am having SUCH an AMAZING time meeting women who I have only had the opportunity to meet over the internet. It is such a thrill to be able to put a real person together with women that I have had the pleasure of knowing for years!!! Thank you for stopping by and I hope to share more news soon! 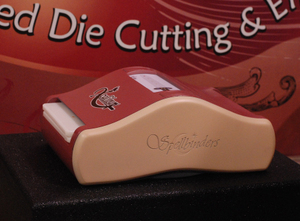 So much fun to see you for a minute and how is it that I forgot to stop by Spellbinders to see that new machine! I did get to Copic though!!! Thanks for that tip. I went by the booth as well, and I asked whether the machine would be compatible with other mfg's dies. They told me that the Xcalibur is NOT compatible with Sizzix Original Steel Rule dies. Very interesting. I'll be curious to see this in action. I can't wait for the Xcalibur. I know that this machine will be perfect for those with disabilities and Carpal Tunnel. Thanks for sharing! crud--I think my comments got lost! Love the handle the color and the drawer! Thanks for the CHA scoop! Thanks for the updates...although...I'm not sure I like them...my wallet is already empty!!! LOL!! I am stoked about more Nesties!! I still am trying to complete the previous ones!!! Thanks for all of the info! I am looking forward to the new dies! Great post! I want an XCalibur! I am happy that the hopeful price point isn't a lot more than the Wizard. I have never had a die cut machine, and was picking one out when you came out with this news, so I am waiting! Sign me up for one!!! I have been using the Zipe mate and was considering buying the Wizard, but now I want this one instead. I already have my money saved. Thanks for sharing this awesome post! Can't wait to see what the future brings to papercrafting via Ellen Hutson LLC!!!!! I was at the Spellbinders booth yesterday and out of all the racks and racks of dies, the new rectangle sets were what stood out for me. I can't wait to be able to order these! Thank you for your report! Everything sounds so fabulous! Have fun!! The color...I don't really care about what color it is. Function is more important to me than form. Love that there is a drawer to hold the plates! Love the handle! That will make it easier to store away and bring out when needed. All the way around...a great piece of equipment! My gosh, how many die cut machines can a girl own? If I get the Excaliber I will have 4!! Thanks for all the information. I am excited also. Thanks for the update Ellen! Please tell all the Spellbinder girls the '07 DT is at home cheering them on!!!!! Thanks for taking time out of your super busy schedule to keep us informed. I really appreciate it. Have fun! TFS. I am so glad I have not bought a die cut machine yet... THIS is the one that seems to be what I have been waiting for!!!! Yahoo!!! I would recommend having the handle at one of the ends, so it carries hanging straight down instead of at a perpendicular angle, that might put pressure on your wrist.. in case 'walking' some distance and if heavy (walk from parking lot to convention center for crop, etc.). I know, perhaps lame, but I'm all about comfort!!! You had me at "has a drawer to hold all of your plates"
Wow my dear! A whole load of news... I love the enthusiasm. It is what makes buying from you so easy in the end. Cannot wait to hear news on when those new products are in your store. Will there be a wait list? Have fun and keep the smiles and news coming! PS - on the Excalibur the name sort of suggests metallic of some sort but in my book where the Cuttlebug rules fun colour is great and I LOVE the idea of somewhere to store the plates!